Okay, proud of myself for being on top of things, for the most part, with blogging so far this year. I did one of these wrap-up posts for January, HERE, and I'm hoping to incorporate some more items this month based on things I saw and liked on other people's wrap-up posts. Usually I start with my challenge progress, but this month I'm going to start with my reading stats, etc. So for, for the year of 2019, according to Goodreads, I've read a total of 39 out of my goal of 215 books. February made up 18 of those. I am currently 5 books ahead of schedule, so I may be raising my goal for the year to 220. Here is a list of the books I've read this month, and I've linked them if I got the review done. Something interesting I noticed with the spreadsheet I'm using to keep track of my books this year is that I only read female authors until just recently. And then I had three male authors all at once. Kind of weird! Or maybe it just shows how much romance I'm reading, although even most of the YA I read is by female authors. Other February stats I want to talk about have to do with how many posts I did. Let's just say I did NOT do any better about doing less posts this month. I've posted 49 times this month, and it's a shorter month than January where I'd only posted 40 times! March looks pretty busy too. But right now I'm working hard to keep April from filling up and getting crazy. We'll see if I can stick to that as more tours come out that I want to be a part of. Only 11 were reviews, although one was a mini-review post and had 5 reviews in it. According to my spreadsheet, my rating average was 4.4 stars, down from 4.5 last month. 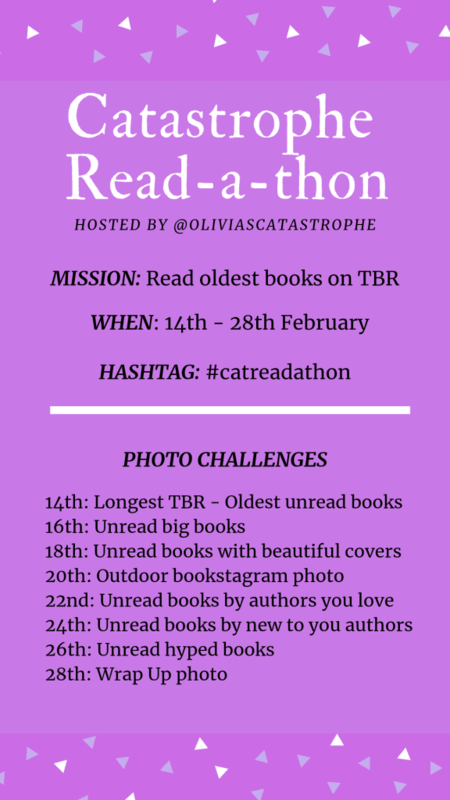 So, I signed up to do this challenge with Olivia's Catastrophe. I didn't get to all my books that I set as goals HERE. I did get three read, Slaughterhouse-Five, Rabbit and Robot, and Moonlight Sins. I started a 4th one, Riot by Jamie Shaw this week, but didn't get it done in time. Because I just had to make sure I was keeping up on my review books. But I'm still proud of getting about half of my goals done for a two week challenge. None of them are reviewed yet, that will be in March's post I'm sure. 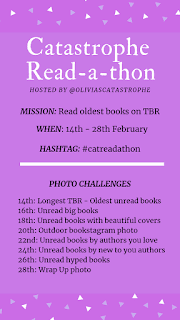 February 26th - This one also includes the two weeks after it, due to there not being a lot of books each week, and me wanting to get set to start doing this on Wednesdays. Another goal was to comment on other blogs more often, and I feel like I'm continuing to do better, this is a work in progress. But there were only 5 days this month I didn't comment on someone else's blog. My third goal for blogging was made last month, and it was to work on cleaning up my Goodreads TBR. So far it has only been on there, but I plan to do some physical TBR cleaning in the near future, especially if I want to move this summer. 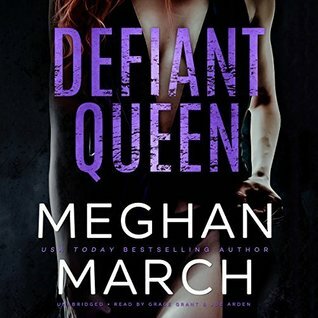 I've been doing giveaways every week with this post, in order to get rid of the ARCs I have already read and know I won't read again, so I'll pass them on. Still haven't come up with my own badge for this one, but I'm working on it. I'm also going to start adding a Link-Up to the posts in case anyone else wants to join in, because I know a few of you have! February 23rd - Giveaway open till midnight tonight! 2. For my reading resolutions, I am still working on the goal of reading books that were recommended. 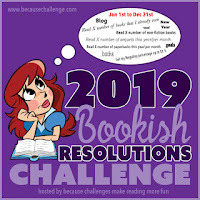 I got the review posted for the one I read last month, Shadow and Bone, and then I read a second one, Slaughterhouse-Five by Kurt Vonnegut this month, which I'll probably post a review of in March. Also, as I mentioned above, I may be upping my goal of books to read on Goodreads to 220, based on the fact that I am more than 5 books ahead. Haven't decided yet. May wait until after March to see if I'm still ahead that many or not. 3. For my writing resolutions I am pretty proud that I've found a critique partner! I had some suggestions of websites to try, one of them being CritiqueMatch.com. And the first person who reached out to me has been great! In fact, what she's having me read for her is sooooooo good already, I feel a little embarrassed to share my writing with her. I also had a co-worker/friend from the bookstore who is a romance reader like I am, likes all the same authors really, read through my short story. She liked it, she said, but she also gave me a great idea for something I want to re-do in it. Since it is kind of based in New Orleans, I also reached out to my friend who the bar in the story is based on, and asked him if I could use the bar's real name, to which he said yes. 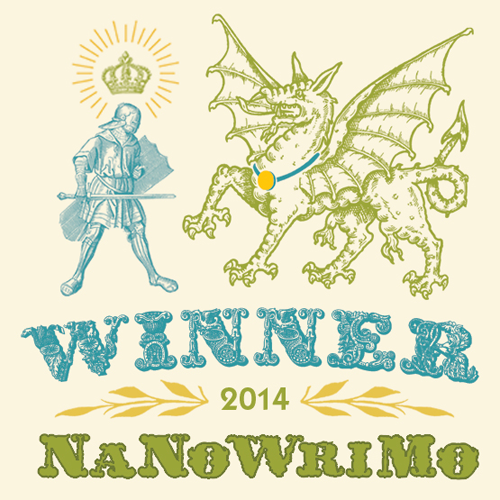 So I am feeling really good about finishing up my short story. I even have a short get away planned during my spring break in March where I'm hoping to really get down to work on the short story and maybe work on finishing another story I've had sitting around. Well, I've improved by one of my goals for this one by reading Rabbit and Robot by Andrew Smith this month. Hoping to pick at least one more if not two, to get read this month! Still no discussions, even though I keep having thoughts on topics I want to do! I guess I need to just pick one and as soon as it pops into my head, immediately find a spot on my blogging calendar for it. 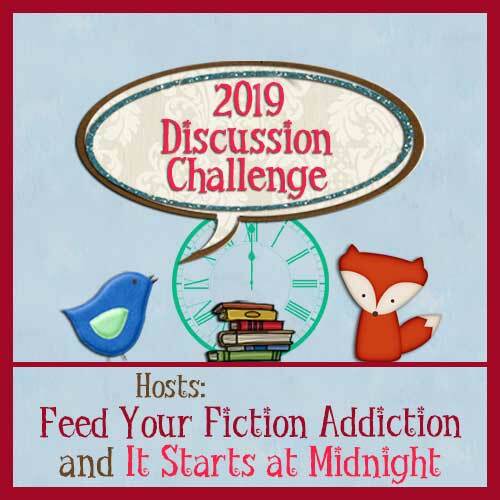 I need to come up with a button for this one I think, but for the First in the Series Challenge, I haven't read any more since I read Shadow and Bone, but since I only have a goal of 6 for the year, that is probably good. The Last 8 by Laura Pohl - I've got an ARC of this, meant to have it read by this weekend, tomorrow actually, but with doing the Catastrophe Challenge last month I didn't get it read yet. Fingers crossed I will still get to it soon. The Everlasting Rose by Dhonielle Clayton - currently reading, was supposed to read in February, but again, due to the Catastrophe Challenge got started late. Will post the review as part of a tour on Monday, the 4th for sure! It kind of looks like maybe I've bitten off more than I can chew? We'll see. Like I mentioned earlier, I do have spring break, a whole week off, this month, so maybe? 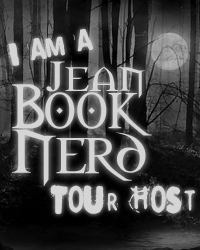 A few listed are ARCs that publishers sent me without me requesting them specifically, so I may not get to them over what I did request and sign up for blog tours. There are also a couple that I don't think I've heard back from the blog tour people yet, so I may not even be getting to read them. Also a couple were read this past month if you remember from earlier in this post, they'll just be getting reviews posted in March. Best of the Bunch is a monthly linkup where we can share the best books we read each month and award one of them "Best of the Bunch." This blog hop originated at Lyrical Reviews and then moved over to Always Lost in Stories. At the end of 2014, hosting was handed over to A Cocoon of Books. At the end of each month, take a look what you read that month and share your favorites. Then tell us which one is the Best of the Bunch — the one everyone should add to their to-read lists right now. 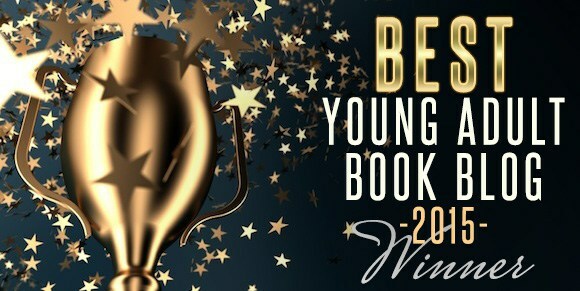 You can use any criteria you want to determine which book to award Best of the Bunch. Then come back here and link up! The linkup will post at midnight Eastern Time on the last day of each month. 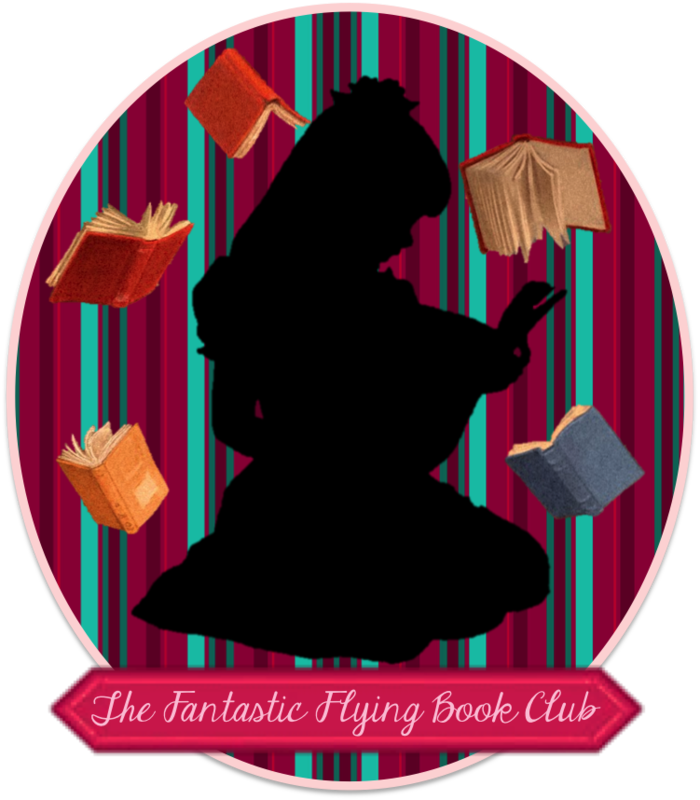 On your post, please include a link back to this page or to the homepage for A Cocoon of Books! I loved so much getting back to one of my favorite all time stories and the characters! 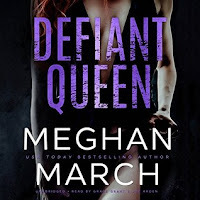 Now, for my Adult Romance top read for the month, I'm going to actually cheat a little and pick a trilogy that I listened to this month, because they were so good I couldn't wait in between each one! I think that's all I need to wrap up, for now! 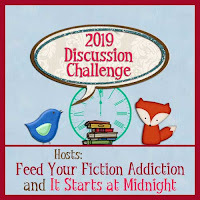 I did link to the giveaway I have going until midnight tonight, and a new one will start tomorrow on my Cleaning Up My TBR post. You had a seriously great month, and I appreciate the inspiration for cleaning up my own TBR. In the past, I've had this kind of 'My TBR is set in stone and I MUST read all these books!' attitude, and it's freeing to be out of that headspace and realize that some books no longer fit who I am now or what I need from my reading, and it's okay to remove them if I no longer feel like reading them anymore. Thanks for being an awesome book blogger! I think looking at the fact that my TBR was like over 3000 books on Goodreads is what kicked me in the pants. Glad it was inspiring to you! If you post any more, come back and link up! I've done a link up for tomorrow's post. Thanks for stopping by! Wow I can't believe you read so many books in one month! That's how many I've read so far this year lmao. I'm glad to see Courting Darkness was so good, I loved LaFevers' Grave Mercy series. I have been on top of my reading game this year! Just have been in the mood to read as much as I can. If you liked her Grave Mercy series, you will probably love this one like I did. Thanks for visiting! Woah, you are really killing it with reading. And that's fantastic your writing is going well and you have a critique partner. This year I really want to get back into my WIP. Becoming a published author is a goal of mine, so I need to get back into the routine. I used to be so good at it but reading/blogging and life in general often get in the way! This really just seems to be a year when I'm in the mood to read! And the critique partner is great so far. I'd like to see a story of mine either get published or self publish at some point. I hope that you get back to your story this year if you have time. You're right though about blogging getting in the way sometimes. As well as reading. :-) Thanks for stopping by! I think reading three from the list is a great amount! 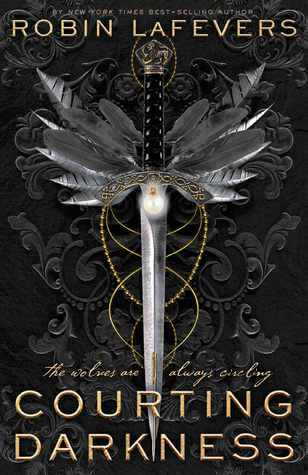 Thanks for reading with us x And I really enjoyed seeing your review for Shadow and Bone. I read Lucky Suit this month as well. That's a lot lined up for March but I hope you manage them all! A few of the ones for March I've finished, just need to post their reviews this month. Thanks for stopping by! You did awesome! I see 3 books in your list I want to read. The story of Fred Rogers is definitely one of those. Happy March! It was a surprise one, didn't even know about it till I got the ARC. It was neat to read and some of the songs/poems I knew from the show when I was a kid. Thanks for visiting! Good luck with the critiquing/ writing! That's awesome that you've had luck finding a critique partner. Courting Darkness looks great, I'm looking forward to revisiting that world! I really enjoyed it. It was great to be back with those characters. Thanks for stopping by! I am always female author heavy as well. I read across ages, but still, I seem to pick many, many books written by women. I am jealous you read the new Reid serial. I love her! Well, I've only read the first one, although I'm halfway through book 2 right now, I love her too! So excited to get to meet her in August at Book Bonanza. Thanks for visiting! I try to save the TBR posts for when I'll be reviewing, but don't always remember. I hope I get to Wicked Saints, it is one I want to read really bad! Thanks for stopping by! OmG, you read so much! I want toknow your secret! And also with so many blog post, your the one to look up to. I think it's all the cold weather we've had with snow days from school and just not wanting to leave the house, that's kept me reading almost constantly! Thanks for visiting! Wow your monthly wrap up is legit! It's so full of information I am so going to be taking pointers for my own monthly recap. Good for you for getting so much this month and for getting your reading stuff done. Also, congrats on getting so much writing stuff done. My goal is to get my own writing done at some point this year. I have to say my own year has been crazy busy as well. Feels like I haven't had enough time to get things done towards my other goals outside of blog tours. Can't decided if it was too full of info or what. But it was something I had time to work on. Crazy busy, but lots of time for reading so far this year with all the snow we've been getting. Good luck with your writing! I've got to make sure to keep working on mine. Thanks for stopping by! I'm glad you liked Courting Darkness. I've been eying it for a while but I think I need to read the her other trilogy first. Definitely read the other trilogy, although they are so good, you'll be glad you did! Thanks for visiting! Oh you had such a busy month! I am seriously impressed that you can read so much! I have been in a reading slump for the past couple months so I'm not reading like I use to. I definitely need to clean up my goodreads TBR. I feel like there are so many books on there that I am not going to read. I hope that you enjoy your spring break! I've just been in the mood to read more than do much else lately. Good thing for my blog, other than being behind on reviews I guess. Thanks for stopping by! Wow, 49 posts in a month is crazy! I don't know how you do it!! I really want to read Courting Darkness. I have my pre-order, so I just need to get to it. Soon. I've got to cut down! It's so hard! But I'm working on it. Courting Darkness was very good! Hope you can get to it soon! I've been noticing your blog has been on a roll and I love it! So many excellent reviews and posts. We both read The Boyfriend Whisperer 2 and I enjoyed it very much. Trying to keep getting better all the time. Glad to hear others liked it. Thanks for stopping by!